Pueblo Native Americans give a performance in Pullen Hall including a talk about customs, sand painting, and dance. 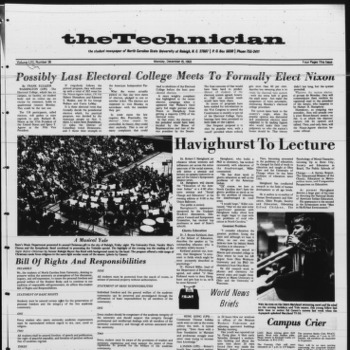 December 17, 1968 "Education of the American Indian"
Professor Robert Havighurst of the University of Chicago gives a lecture titled "Education of the American Indian" as part of the Symposium series "Man in his Urban Environment"
NC State students participated in a march to the Capitol with Tuscarora Indians. 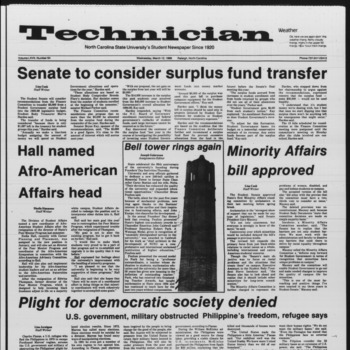 They were protesting changes in Robeson County schools, the lack of federal recognition of the tribe, and the name change from Tuscarora to Lumbee. Tribe members spent the night at the Baptist Student Center before marching to the State Capitol. The Indian Hobbyists Club was started to celebrate Indian history and dance. The club participated in a pow wow organized by the Order of the Arrow, a branch of the Boy Scouts of America. 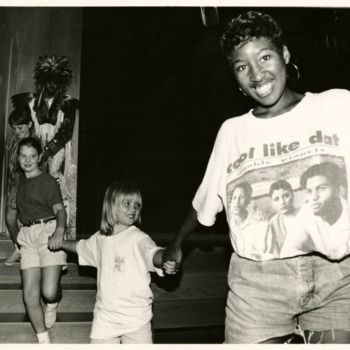 The First Annual Pow Wow was held in 1990. 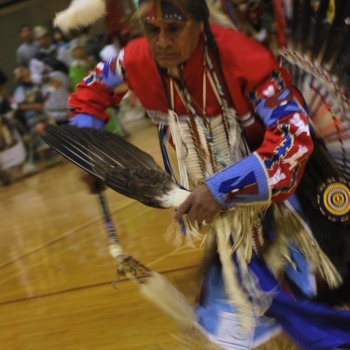 The Pow Wow is a celebration of Native American culture, including food, dress, and especially dance. Cultural Awareness Day was sponsored by the Native American Student Association and included traditional dancers and a medicine man. Chancellor Larry Monteith and Native American students sign a proclamation naming November Native American Heritage Month. 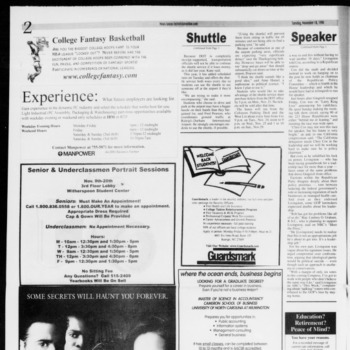 Monteith also discussed a peer mentor program and increased recruitment of Native American students and faculty. 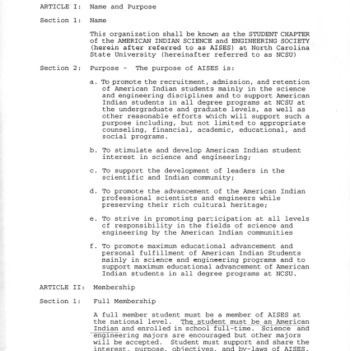 The NCSU Chapter of the American Indian Science and Engineering Society was formed. 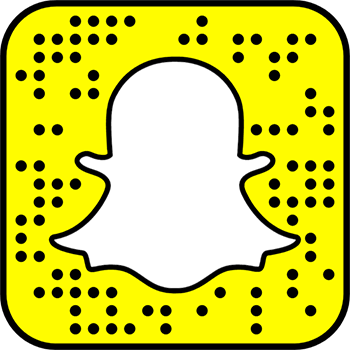 Three organizations, the American Indian Science and Engineering Society, the Native American Student Association, and the Society of Native American Culture merge under one name, the Native American Student Association. 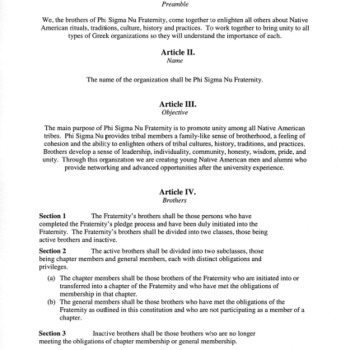 The NCSU Chapter of Phi Sigma Nu (Native American fraternity) was chartered. 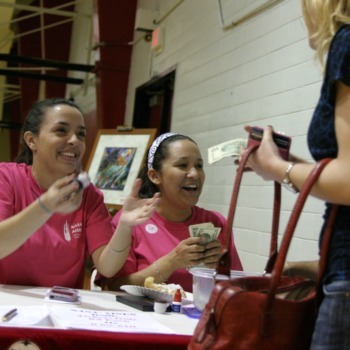 Organized by the Office of Native American and Hispanic Affairs, the Native American Symposium offered information for incoming freshmen including how to navigate campus and financial aid. 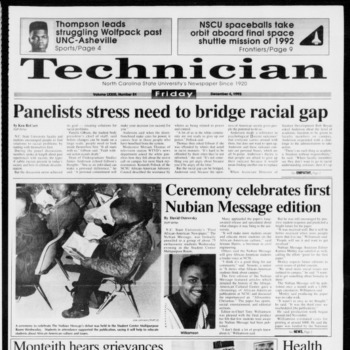 The NCSU Chapter of the American Indian Science & Engineering Society hosts the conference in Talley Student Center. 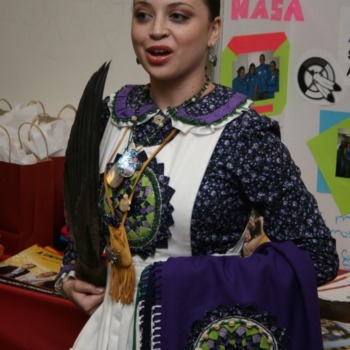 Activities included a career fair, presentations, campus tours, and a pow wow. 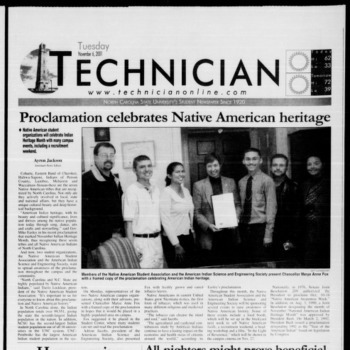 Members of the Native American Student Association and American Indian Science and Engineering Society present Chancellor Marye Anne Fox with a framed copy of a proclamation naming November Indian Heritage Month. 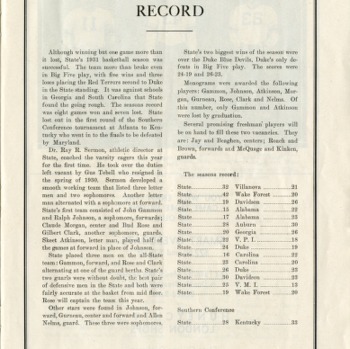 Governor Mike Easley signed the proclamation. 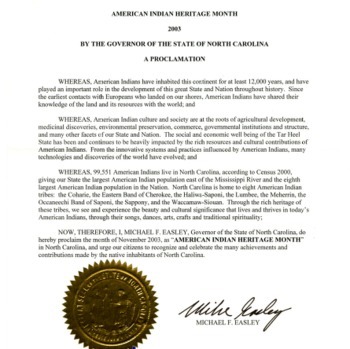 Governor Mike Easley declares November Indian Heritage Month in North Carolina. Native American Student Association members present Chancellor Marye Anne Fox with a copy of Easley's proclamation. 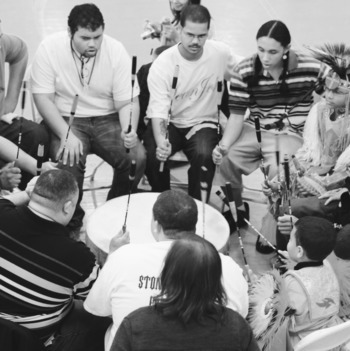 High School students from Native American communities visit campus. 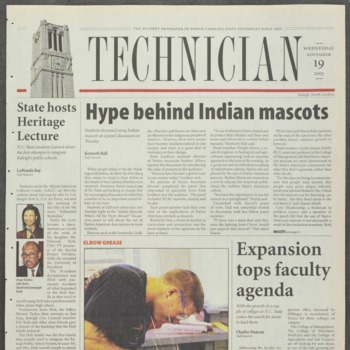 November 18, 2003 Indian Mascots : What's All the Hype About? 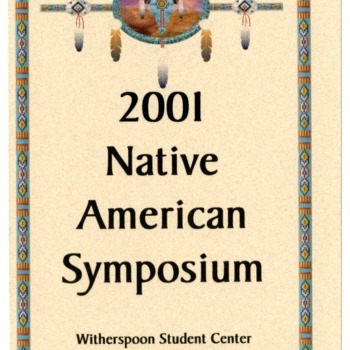 The Office of Native American Student Affairs sponsors this panel discussion. The Native American Forum "Language and Identity" hosted by Multicultural Student Affairs and CHASS. The NCSU Chapter of Sigma Omicron Epsilon (Native American sorority) was chartered. 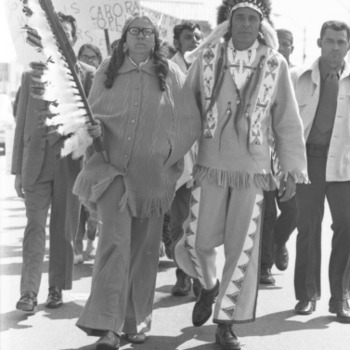 The minor in Native American Studies was established in Interdisciplinary Studies. 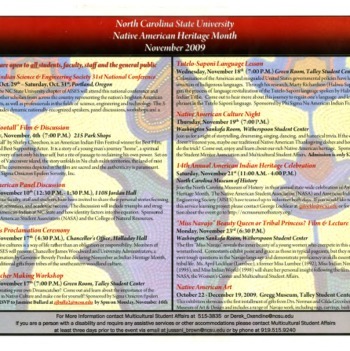 Native American Culture Night is an annual event sponsored by the Native American Student Association. 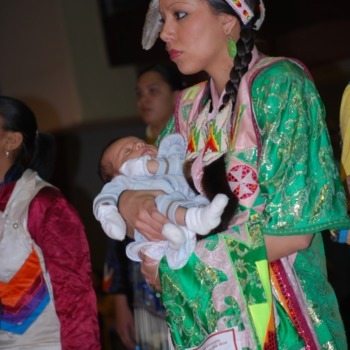 Sponsored by the Native American Student Association, the Pow Wow is a celebration of Native American culture, including food, dress, and especially dance. NCSU Libraries' Wolf Tales program records the personal stories of students attending the 2017 Pow Wow.